The new building does all this and more – its curved form creates a welcoming entrance to the school and its interior spaces provide both an engaging learning environment, and an adaptable community facility. The space is divided into two, a curved parapet wall to the meeting room and entry, contrasting with a simple pitched roof over the library space. Walls step in and out in response to interior functions using colour and materials to create a lively facade. Artificial lighting is rarely used as the design maximises day lighting and natural ventilation. The librarians’ space and issues desk are the immediate focus on entering, highlighted with colour, while a window seat with its ply-clad frames and colourful seat squabs offers a unique setting creating a direct relationship to the playground outside. A flexible activity space at the centre of the building is configured to allow use by a mix of group sizes including large group activities. Sliding doors connect the library with the adjacent central school courtyard. The students and school community have embraced the new library. 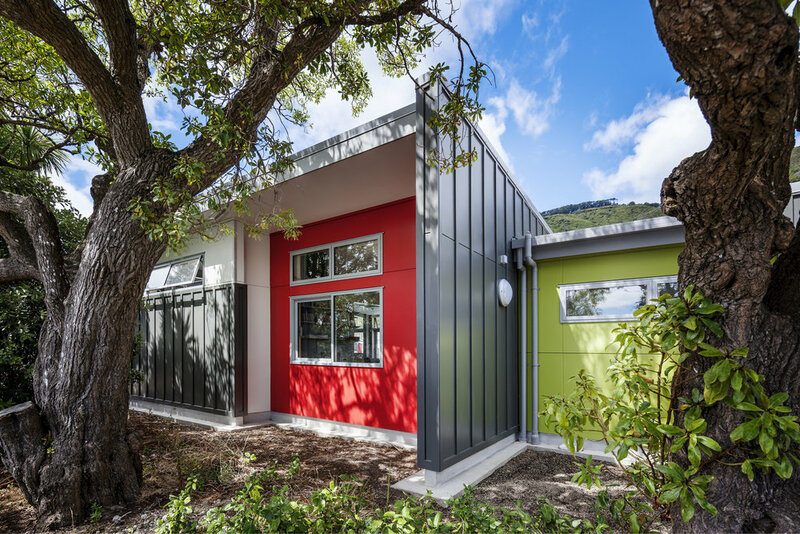 As envisioned, the colourful dynamic space has become a well-used resource, a highly visible and engaging focus of learning at Muritai School.